Having a sound roof over your head is one of the most basic necessities for human survival. It’s even more critical that your roof be in tip-top condition before intense rain, hail or a snow storm arrives. 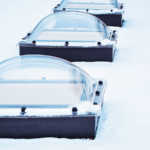 Furthermore, in winter, lower temperatures and ice can compromise the integrity of a roof. It’s essential to start preparing your roof as soon as severe winter weather has been predicted. If you own a flat commercial roof, here are some basic guidelines for preventing winter storm damage on your roof. Long before a winter storm has been predicted, check to see if there are hazards on your flat commercial roof. This entails removing any overhanging tree limbs. As trees are susceptible to disease, it’s easy for diseased tree limbs to snap and fall on a roof, which can cause major damage. Fallen limbs can also create electrical problems. Even worse, they can injure people inside a building when they fall through the roof. Moreover, wet mulch doesn’t dry out, which can lead to the deterioration of roof shingles, in addition to rotting conditions on a roofing structure. Additionally, remove any weak roofing sections. Be sure that all added-on devices on your flat roof, such as satellite dishes, HVAC equipment and electrical signs are properly anchored. When roof add-ons are not secure, it can lead to damage. Even if your roof is in considerably good shape, it still helps to waterproof it to ensure it’s in excellent condition before inclement weather hits. Keep in mind that roofs with asphalt-based materials tend to crack in low temperatures. 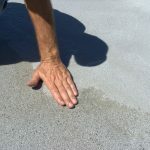 By regularly applying waterproofing coatings, moisture can be warded off, which can increase the lifespan of your roof. You’ll need to have your roof inspected before a winter storm is in the forecast. To be safe, hire a professional roofer to do the job. Besides being dangerous for you, walking on your roof can be harmful to the roof. On the other hand, you can do some inspecting on the ground. For example, using binoculars, walk around your building to note any issues that you can report to a roof inspector. If you’re able to do so, climb on a ladder so that you can detect any warped, missing or broken shingles. Look for rusted areas on flashing and worn or cracked spots around pipes. Another warning sign is discovering nails that are sticking out that should be hammered down. Check for any shingles that are buckling or curling. Noting a lot of shingle granules in gutters can suggest that your roofing shingles need to be replaced. You can also inspect your roof from inside your building, such as looking for stains on a ceiling and peeling paint. If you see any daylight in your attic, this can signal a problem. Inspect attic insulation to see if it’s wet and if there is dampness or old moisture spots on rafters or wood. Because water on a roof can occasionally freeze, ice dams can form. This problem means that water can continue to pool, which creates more weight on your roof. This causes the roof gradient to flatten, which leads to roof damage. Consider that a satellite dish heater can be used to protect satellite dishes from snow. Inspect for clogged gutters or roof drains. When gutters are jammed, it can signify that rainwater has collected on your roof. It’s essential that gutters are cleared out before rainfall starts so that they perform properly. Have ice and snow cleared away when excessive amounts have accumulated on your roof, such as when there’s a buildup or two inches of ice or two feet of snow. If you have a flat roof, it’s at risk for ponding water, also known as standing water. 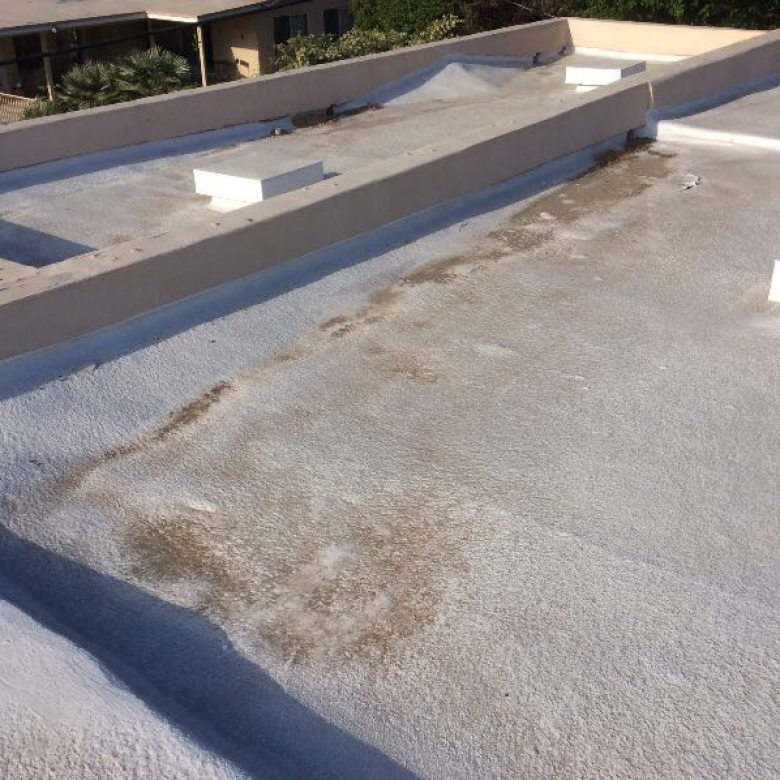 This is a condition in which rainwater fails to evaporate from a flat roof after 48 hours following rainfall. At RoofSlope we have an exceptional product designed to fill in low spots on flat roofs. 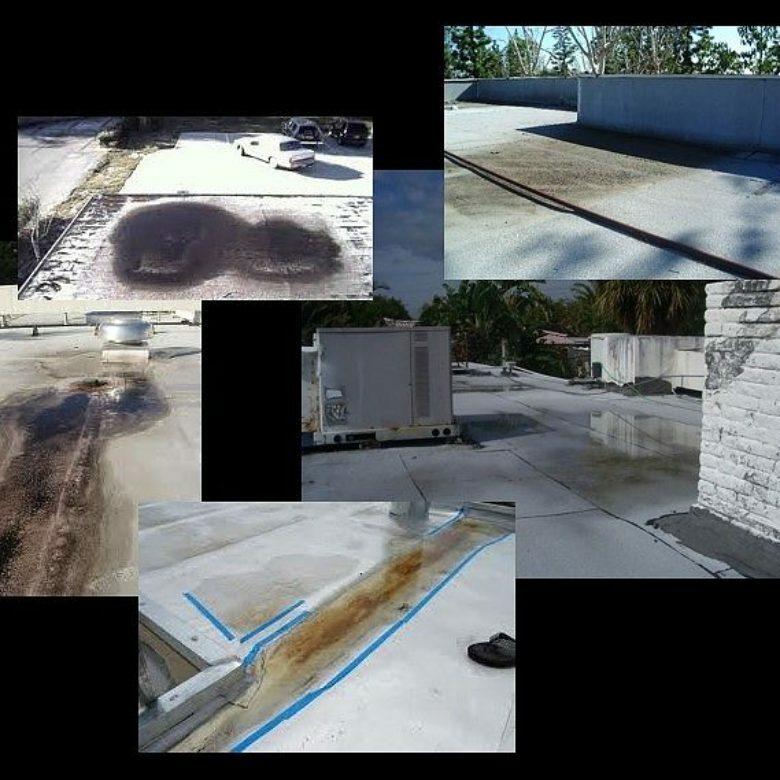 Please contact us and learn more about how we can help you prevent ponding water on your flat commercial roof.